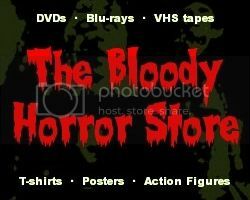 Who would have believed that the Dollar Tree sold a VHS transfer to DVD of "Horror Express" (1972)? I snapped this up quicker than a squirrel deflowering a hazelnut. Here's the IMDb blurb: "An English anthropologist has discovered a frozen monster in the frozen wastes of Manchuria which he believes may be the Missing Link. He brings the creature back to Europe aboard a trans-Siberian express, but during the trip the monster thaws out and starts to butcher the passengers one by one." If you haven't ever seen this weird Spanish/English co-production starring Christopher Lee, Peter Cushing and Telly Savalas then get yourself a copy right now for $1 because it's a classic of '70s horror cinema. The transfer isn't the greatest in the world and towards the end you can see that the original tape was badly damaged but it's still more than good enough to watch. In fact, the transfer adds a certain nostalgic quality and even some atmosphere rather than detracting from the viewing experience. 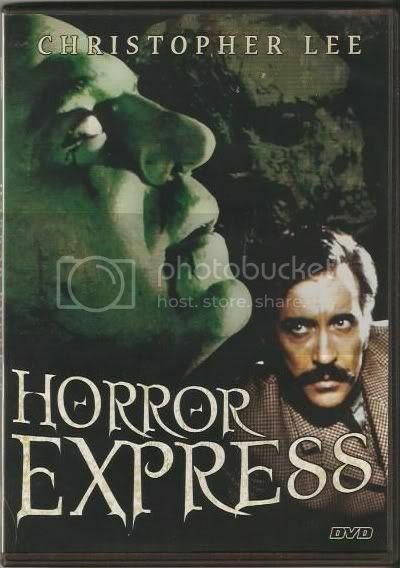 I highly recommend "Horror Express" and will probably do a full review of it one day. If you are too poor at the moment to see "The Thing" premake in your local overpriced movie theatre then this is a worthy substitute.